Alma Robert "Al" Schauerhamer, Ship's Cook 2/c, born May 2, 1922, Pocatello, ID, went through high school and Dunwoody Baking Institute. He enlisted in the USN Feb. 3, 1941, at Salt Lake City, UT. For three months he was stationed at San Diego NTC, CA. In May 1941 he went aboard the USS West Virginia. 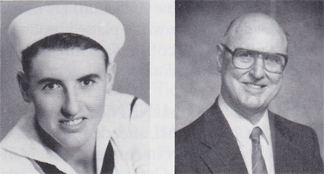 On Dec. 7, 1941, after the ship sank, he caught the last motor launch to leave the bow. They landed at Hospital Point and that night he was sent with others to guard the fork in the road. After the attack he was stationed at Fleet Machine Gun School and Anti-Aircraft Training Center on Oahu, after which he was transferred to Iroquois Point, Pearl Harbor. Early in 1944 he applied for new construction and was assigned the USS Ozark (LSV-2). They were in the invasions of Lingayen Gulf, Iwo Jima and Okinawa. While at Iwo Jima he witnessed the flag raising on Mt. Suribachi and saw the B-29s fly over on their way to Tokyo. The USS West Virginia was also at these invasions. Discharged Oct. 17, 1945, with the rank of ships cook 2/c. He received the Pearl Harbor Commemorative Medal. Married and has two children and four grandchildren. He is a retired baker and enjoys fishing and golfing.